With the turning of the Wheel comes a new design for the Blind Guardian website. 2010 sees the release of At the Edge of Time (preceded by the A Voice in the Dark single) followed by extensive touring activities around the world. The new Blind Guardian website will become your source for all matters related to the band, our music and the Blind Guardian live experience. Please, take some time, look around and discover some new and wonderful things. The experience doesn’t stop here though, make sure you keep coming back since new content will be added often. 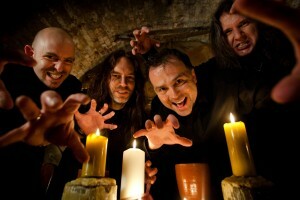 Comments are also welcome, for this we suggest our vibrant forum at forum.blind-guardian.com. If you have friends or acquaintances that may be interested in Blind Guardian we have made it easy to share our news items with them. At the bottom of each post there are ways to share the gospel of Blind Guardian with people on Facebook, Twitter, MySpace and much more. And if the work grind is getting you down and you can’t check the website as often as you would like then just use our RSS feed to be notified automatically. Have fun with the new website, we hope to see you here often. Enjoy the new music on At the Edge of Time and the A Voice in the Dark single. We will see you on the road in a city near you.